The core essence of “Greater Things” is that there is always a better way to do things — anything — whether it be religion, politics, science, academia — anything. To the extent that we get institutionalized and codified in a set belief system, is the extent that we inhibit the ability to grow and learn new and better ways. – Dr. Andrew Moulden. A growing number of doctors, other health professionals and citizens are attempting to prevent the humanitarian disaster planned for this October when the new H1N1 vaccine is to be deployed in a grand scale, military, war on terror manoeuvre . “Primum non nocere” (“First do no harm”), medical ethics standard attributed to Hippocrates that became obligatory for physicians prior to practicing medicine in the 4th century AD is still upheld by some doctors who oppose the worldwide October plan including what Global Research Director, Michel Chossudovsky warns is a military operation leading to global militarization control of individuals. “Realities are turned upside down. The British government is deliberately misleading the British public,” states Chossudovsky. “State and local public health planners,” however, “have been asked to plan for vaccine becoming available mid-October under the following scenarios: 40, 80, or 160 million doses becoming available from the 5 manufacturers (total) over approximately a one month period, followed by weekly amounts of 10, 20 or 30 million doses” according to the recent CDC report. Barbara Loe Fisher is alerting the public to recognize that the flu is not the problem and that the dangerous vaccine and further removal of rights requires urgent public education and action to thwart the October plan. Numerous doctors and other health professionals agree with Alliance for Human Research Protection Director, Dr. Vera Sherav who stated in the KPFK interview yesterday that H1N1 vaccine has potential to rapidly and dangerously spread the disease. War tactics of fear mongering war and media black-out on vaccine dangers and martial law is seemingly designed to cause ill-informed citizens to submit to the dangerous H1N1 vaccine. “[A]mply documented and denied by Western governments, the proposed vaccines could result in more deaths than those caused by the H1N1 influenza, as confirmed by Britain’s Health Protection Agency and the letter, sent to about 600 neurologists on July 29, is the first sign that there is concern at the highest levels that the vaccine itself could cause serious complications. * More people died from the vaccination than from swine flu. * 500 cases of GBS were detected. 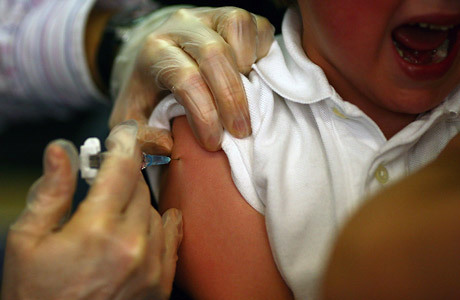 * The vaccine may have increased the risk of contracting GBS by eight times. * The vaccine was withdrawn after just ten weeks when the link with GBS became clear. Massachusetts legislators have already passed pandemic influenza legislation legalizing entering homes without consent of occupants, quarantining without consent and abandoning free assembly of citizens. Through Facebook, VRM is leading a global “We’re Not Going To Take It” events next weekend, August 28th-30th. “This is about the most basic of all human rights: control over our own bodies and health decisions,” VRM states. Learn more, take responsible action, and keep asking, “Why?” and “Why not?” Subscribe below and see Dupre’s website. For more information H1N1 and about how you, your family and community can affect change by pressuring Congress to pass self-shielding legislation, see “Warning in the eye of the false flag storm” by Dupre, complete with community learning activities. Watch the edutaining, Video/Song: ‘Trillion – Say No To The Vaccine. Want to write for the Examiner? Please email Dupre for more information about this opportunity. Keep the peace through responsible action and accountability.